L-Arginine at a ratio with alpha-ketoglutarate of 3:1 is more effective than other AAKG formulas on the market. More Arginine in the bloodstream gives you more energy and better muscle pump. 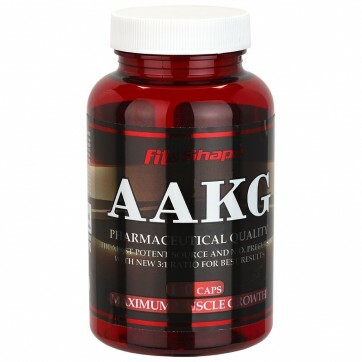 AAKG or L-Arginine Alpha-Ketoglutarate in a ratio of 3:1 is a precursor, which increases the amount of absorbed nutrients and improves recovery. Its vasodilating action helps you build your dream body quicker - due to the better absorption of nutrients. The amino acid L-arginine plays an important role in the development of cells, healing of wounds and the release of ammonia from the body. It is extremely important in the synthesis of creatine, which leads to greater strength and endurance for athletes. Arginine reduces the time for treatment of injuries caused by stretched or torn muscle fibers. DIRECTIONS OF USE: Improves recovery and lean muscle mass gain. Enhances tone and endurance. Lowers blood pressure. On workout days, take one serving before and one serving after workout. On non-workout days, take one or two servings between meals. INGREDIENTS: L-arginine alpha-ketoglutarate 3:1, hard gelatin capsule.